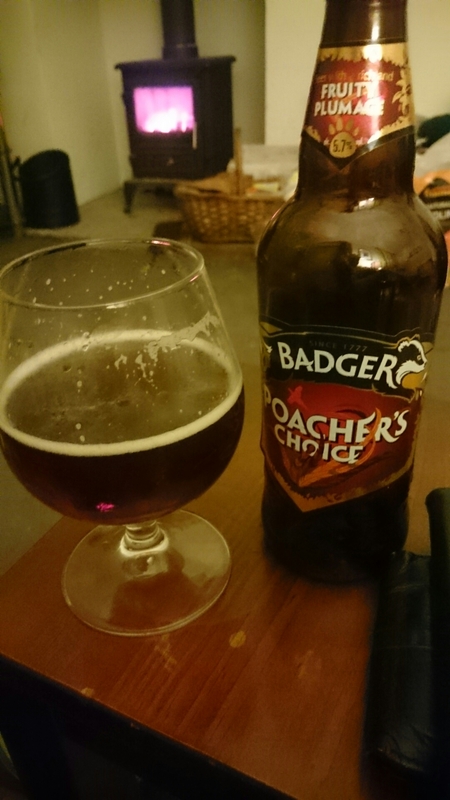 As the winter months grip us, and the dark cold nights set in, there couldn’t be a more fitting time of the year to savour my favourite of all Badgers wonderful array of fine ales than Poachers choice. Set in Blandford st Mary in Dorset, Uk lies the Halls and Woodhouse brewery where the delightful Badger beers are created. I can still remember the first time I tried this beer. At the time I dont think there was anything like it available in the Uk market. So rich and diverse was the aroma and flavour experience. My ale loving mate and I used to describe it as liquid cake, so rich and fruity was its flavour. This beer is a classic strong British ale with a difference, coming in at 5.7%abv it packs enough alcohol to warm you up during the cold months of Autumn and Winter. It pours a dark rich ruby red and has a thick white head which unfortunatley disappears after a few minutes. This takes nothing away from the aroma though as your nostrils are treated to wonderful rich malty notes that sit behind an explosion of dark rich fruits and spice. I’m talking about plum sweetness, blackcurrant juicyness. I get richness of dates and the spicy notes of vanilla, damson, liqorice. Its an extravaganza of aromas. If the aromas of this get you salivating the taste does not let you down. Its so satifyingly rich and warm, the strong alcohol mixed with the robust malty fruitiness simply warms you up from the inside out. The mouth feel is full, covering the pallet with rich fruit cake like flavours,hints of dates and caramel, powerful damson and liqorice mixed with juicy blackcurrant are perfectly balanced out with expert hop balance offering perfect bitterness. The only downside to this is it sits quite heavy, meaning you can only manage to savour two or three. For me sitting infront of my log burning stove savouring this delicious bottle of ale epitomises my love for the darker colder months. Or indeed matched with a rich hearty stew or some strong cheese. In my opinion a wonderful ale by one of my favourite British breweries. 7.5/10 and highly reccomended.